After numerous delays, the birch mill may start construction within the month in the town of Temagami. Temagami Forest Products says it has finalized the mill's birch supply and financing. The company has commitments for 80,000 cubic metres of white birch — 30,000 committed by MNR from the Temagami forest unit, and 50,000 to be purchased on the open market. The company hopes the $6-million mill will be operational by February and eventually employ up to 60 people. It will be constructed on the same site as the former Wm. Milne sawmill. With dwindling economic prospects, the viability of the town's school, bank and retailers has been shaky. Many in the community hope the mill will end the downturn. The mill has not been without controversy. The company, as part of its birch commitment from Crown land, had made a promise to MNR to pursue aboriginal involvement. Negotiations with the Temagami First Nation acrimoniously fell apart last year. In a surprise upset, Lindsay Cote defeated incumbent Doug McKenzie in the election for chief of the Teme-Augama Anishnabai (TAA) this weekend at Shiningwood Bay, Lake Temagami. The Temgami First Nation (TFN) is the established and well-known aboriginal institution. It is a federal entity with its own chief and represents status Indians only. Members of the Temagami First Nation are eligible for membership in the TAA. The TAA was established to represent all those of Temagami aboriginal descent, including both non-status and status Indians living on and off Bear Island, in the treaty negotiations. Both groups have representatives in the negotiations and the membership of both must approve a final settlement agreement. Previous settlement negotiations failed in 1993, when the TFN membership rejected an agreement by a margin of two votes. That collapse in negotiations marked the end of the remarkable political career of Chief Gary Potts, who resigned in 1995. The agreement was as divisive then as it is today. Chief Cote of North Bay is creator of the Adventures of Nish cartoon strip, a traditional dancer (he coached Pierce Brosnan for his role in the movie Grey Owl), a musician and songwriter. McKenzie has been involved in the land claim since 1972 and has been TAA chief since 1995. He played a strong role in the settlement negotiations and was seen by many on Bear Island as the lead Indian negotiator. This made him the scapegoat for those dissatisfied with the direction of the settlement. His departure may mark a change of direction in negotiations. Earthroots launched an appeal of the August decision that permits a logging road through the Bob Lake Conservation Reserve in the Spirit Forest. Sierra Legal Defense Fund, on behalf of Earthroots, filed the motion with the Ontario Court of Appeal requesting leave to be heard (the court must first grant permission for an appeal). If the appeal is granted, then a full hearing of the court will be scheduled for a later date. The decision, as it stands, could set a bad precedent for conservation-reserve protection, particularly in situations where roads pre-dated a reserve's creation. The court, in its decision, also equated bureaucracy-created policy, in this case for logging, with a statutory regulation, which created the reserve, further weakening environmental protection for all reserves in Ontario. The outcome of this case will be precedent-setting. When Ontario's new conservation-reserve system was built between 1997 and 1999, it was heralded by the government of Premier Mike Harris for its protection of Ontario's under-protected wild places. A primary goal had been to spare wild areas from industrial destruction, particularly by forestry. Hurricane Isabel appears to have weakened from early yesterday's forecasts, but Environment Canada is still predicting high winds and rain for Temagami late Friday and Saturday. Various weather forecasts are suggesting Hurricane Isabel's shadow may cast over Temagami with sustained winds up to 65 kilometres per hour and higher gusts on late Friday and early Saturday. Keewaydin celebrated 100 years at its current location on Devil's Island on the North Arm of Lake Temagami. Two hundred attended a reunion to mark the anniversary held August 13 to 16. Keewaydin is the oldest private institution in Temagami. It was founded in 1894 in Maine and moved to Temagami in 1902, prior to the arrival of the railway. It is also the oldest youth camp in Canada (tied with Kamp Kanawana in Quebec) and the oldest canoe-trip camp in the world. The oldest alumnus attending the event was 1930s guide Hector Green, 90, of Temiscaming. The island is a heritage site with numerous old buildings, the oldest constructed in 1905. Youth camping is the second oldest industry in Temagami, after the fur trade, and Keewaydin kicked it off. The camp has traditionally served a broad role as the social centre for the North Arm of Lake Temagami. The fall Changing of the Seasons ceremony will be held at the north end of Obabika Lake in the Spirit Forest on September 20. The Nishnabai event has sweats, a pipe ceremony, drumming and a traditional feast. There will also be a memorial for former Obabika Lake resident Mary Carol Mathias who passed away in November. Guests provide their own transportation, camping arrangements and food. For more information, contact host Alex Mathias at 705-498-2818. The court ruled in favour of a proposed road through the Bob Lake Conservation Reserve that will allow logging near Spirit Rock. The Bob Lake Road will also permit logging within Spirit Forest between Lake Temagami and Obabika Lake. Spirit Rock is a Nishnabai sacred site. The logging will also abut the world's largest old-growth red and white pine stand in the Obabika River Provincial Park. Nishnabai, canoeists and environmentalists oppose the road and logging. The road was the gateway to logging the area and they had hoped putting an end to the road would stop the logging. The decision paves the way for MNR to give final approval to Liskeard Lumber to work on the road which would be accessed from the abandoned west end of the Red Squirrel Road. Before equipment could be moved in, the vandalized bridge over the Eagle River, near Sandy Inlet, would have to be rebuilt. The suit was brought against Ontario (Crown) by environment groups Earthroots and Sierra Legal Defense Fund. They will appeal. In the written judgement, the Ontario Superior Court stated that its decision was not based on a strict interpretation of the wording of the Public Lands Act, as argued by Earthroots lawyers, but on a standard of reasonableness, as put forth by the province of Ontario. The judgement pointed out that activities in a conservation reserve are governed by regulation, which is created by Cabinet not the Legislature. This gives the Minister of Natural Resources, acting on behalf of Cabinet, broad discretionary decision-making authority and "should be afforded deference" by the courts. The judgement further added that the Public Lands Act, under which conservation reserves were created (not the Parks Act), must be read together with the Crown Forest Sustainability Act, which governs logging. Both of these statutes govern activities on public (Crown) lands and both give the minister broad powers for which there is no appeal process (outside of the courts), not even to the Legislature, written into them. The court accepted that the road will have a negative environmental impact on the conservation reserve, but in the face of this the Minister still has the authority to permit the road. The three judges unanimously accepted that the Minister's decision on the road was "not unreasonable." Posted 9:00 a.m. Updated 10:20, 11:30 a.m.
Fall bear-hunting season is underway throughout the Temagami region. Hunters often attract bears by leaving out piles of garbage as bait. Campers are cautioned to stay away from these sites. 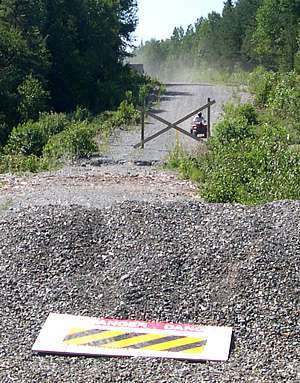 ATV, seen behind the barricade and the berm, in the area closed to motorized vehicles. It is turning onto the bypass (below) around barricades erected by the MNR. On August 12, ATVs were seen travelling the restricted section of the Red Squirrel Road, flaunting its closure to public motorized access. On closer inspection, a well-travelled ATV bypass was found allowing free travel to and from the restricted area. The controversial road was closed to the public over its western portion by the province of Ontario at the Eagle River bridge with the erection of a gate. The best-known gate in Temagami, it has long served as a litmus test for MNR's ability to enforce road closures. Known as the Barmac Gate, it was erected about 1987 after being moved from its former location near Whitefish Bay on Lake Temagami, where it had failed to stop illegal public access. 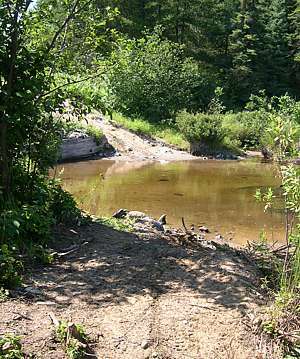 MNR's rationale for the second location was that the river and surrounding wetland physically prevented anyone from circumventing it in a motorized vehicle. ATVs now easily ford the shallow, sand-bottomed river. logging-road construction, has been adamant that public access can be successfully controlled on logging roads. The public accepted the assertion at face value thereby undermining much of the opposition to logging roads in the region. But two recent investigations, one by a provincially-appointed auditor and the other by the Wildlands League, have exposed the failure of the policy. The infamous Red Squirrel Road was built for logging about 1968 without public notice. It has been a flashpoint for locals, tourist operators, natives and environmentalists ever since who objected to the logging, public access and environmental degradation it has caused. In 1984, an illegal extension to the road was started by MNR. In the fall of 1985, the government responded to the public outcry by undertaking, prior to construction, a full environmental assessment, the first on a logging road in Ontario history. When MNR unilaterally altered the completed assessment in 1986 the independent consultant, DELCAN, which wrote the report, refused to support it and had its name removed. When public hearings on the assessment were rejected by the Ontario government, court battles and protests followed, culminating in the blockades of 1989. In all, 344 arrests were made on the road. The last blockade, where 218 people were arrested, was within sight of the bridge. The extension, though completed, has been closed since. Last October it was burned by vandals and the remnant structure removed. It will be reconstructed when forestry companies continue logging, possibly as early as this fall.